YULIA FATMAWATI lives a fast-pace life in Jarkata. It takes her 2 to 3 hours a day on commuting. Every day she is stressful with a heavy task so she drinks little water and do little exercises. You may think those are just the trifles but they be the leading cause of her cancer. In 2015, YULIA FATMAWATI showed the symptoms of uremic bleeding. She took check-up in Indonesia and the doctor diagnosed it was urinary tract infection. Though she took medicines, her symptom was not alleviated. After taking a further check-up again, doctor found that there are stones in the bladder and suggested take laser surgery first. However, the symptoms had not been changed. Thus, doctor decided to take surgery for her. 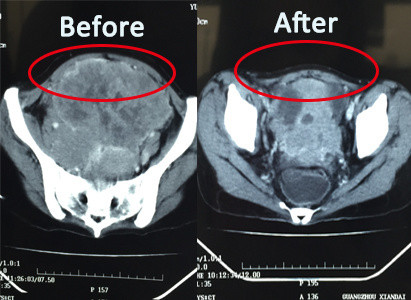 What surprised her was that there was 14-cm tumor in her bladder. After taking the biopsy, she was diagnosed with bladder cancer. The local doctor suggested her taking surgery to remove the whole bladder but she needed to life with artificial urine bag in her rest of life. Due to the fear of taking surgery, she refused doctor’s suggestion. 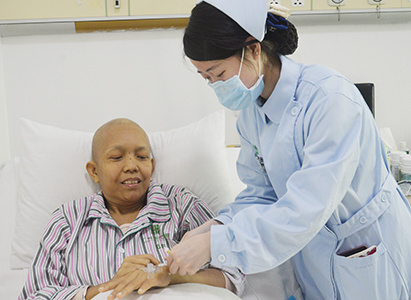 She sought for other cancer options on the Internet, thus she found Modern Cancer Hospital Guangzhou. The minimally invasive technologies in Modern Cancer Hospital Guangzhou deeply attracted her attention. She knew that minimally invasive treatment will not bring a big trauma to the body, only 2mm trauma, which will bring fewer side effects than conventional radiotherapy and chemotherapy. A friend of YULIA FATMAWATI also took cancer treatment in Modern Cancer Hospital Guangzhou and has got a good therapeutic effect so she recommended this hospital to YULIA FATMAWATI. Thus, YULIA FATMAWATI decided to take treatment in Guangzhou, China. With the company of her husband, she was hospitalized in Modern Cancer Hospital Guangzhou in December, 2015. After the diagnosis and discussion of multidisciplinary team (MDT), they made a plan of “interventional therapy+ cryotherapy+ natural therapy”. She had not heard about interventional therapy before. Thus, when taking interventional therapy at the first time, she felt scared and worried. However, after the treatment, all her worry and concern were removed and she gradually built confidence to the treatment. She told us that she saw hope when she felt desperated. So far, YULIA FATMAWATI has taken 5 sessions of interventional therapy, two sessions of cryotherapy and one session of natural therapy. During the treatment, her tumor has shrunk from 14 cm to 8 cm. The attending doctor of YULIA FATMAWATI told us that her condition has been well improved and she is still in the process of tumor. Hope her tumor will be shrunk more. Let us wait for another anticancer miracle! During the anticancer experience, she once cried every day and night but minimally invasive treatment let her see hope and build confidence. She also encouraged other cancer patients to feel positive to the treatment and people should also pay more attention to the daily routine, drinking more water and taking regular exercise to prevent cancer.